Chinese smartphone maker Vivo on February 20 launched the Vivo V15 Pro with a pop-up selfie camera. The midrange smartphone features a thin bezel profile with an under the display fingerprint sensor on the front, and a unibody gradient glass design with triple camera set-up on the back. The V15 Pro has a 6.39-inch super AMOLED screen of fullHD+ resolution. It is powered by Qualcomm Snapdragon 675 system-on-chip, paired with 6GB of RAM and 128GB of internal storage. Imaging is taken care by a 12MP primary sensor, 8MP ultra-wide secondary lens and a 5MP depth sensor on the back. The phone has a 32MP pop-up camera for selfies, which also doubles up as a face recognition module for screen unlock. The phone boots Android 9.0 Pie operating system. It is powered by 3,700 mAh battery, and supports dual engine fast-charging technology – which the company claims would charge 24 per cent battery in 15 minutes. The smartphone will be available in 6GB RAM and 128GB storage. 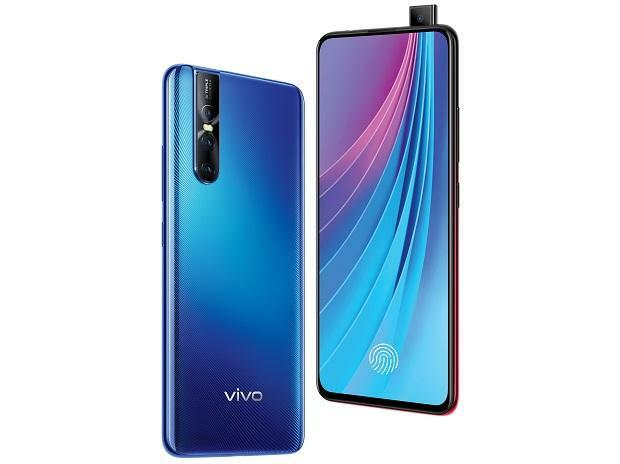 Priced at an Rs 28,990, the device will be available for pre-order across offline and online channels including Vivo India E-store, Amazon, and Flipkart starting today (February 20). The phone will come in two colour variants -- topaz blue and ruby red -- and will hit both online and offline stores on March 6. As a part of launch offer, Vivo is providing below mentioned benefits to consumers on the purchase of the Vivo V15 Pro from both offline and online channels.